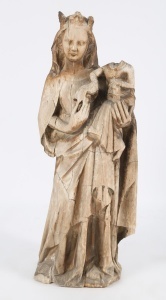 This carved stone Madonna is finely rendered, and a treasure worth being cared for. 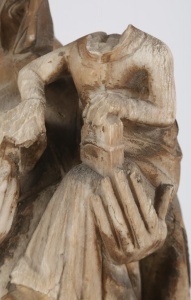 We know it to be from the 14th/15th century, but how could you determine this dating if you were to simply pass it by in a shop window, or for that matter in the wall of a local church? Every piece of art is a piece of history, and many have a story to tell. When looking at any piece of art or any object to ascertain age, one of the first steps is to look for physical signs, forensic evidence if you will, and work backward just as Sir Arthur Conan Doyle’s hero of fiction would. 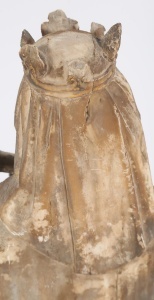 We notice four condition aspects straight away on this stone sculpture: weathering, staining, losses, and breaks. But what do they tell us? The weathering exhibits itself in the form of rivulets running vertically down the face and body. Clearly defined on the front we simultaneously note that the wear to the back is mottled, not vertically streaked and that the robe lines on the back are much crisper. 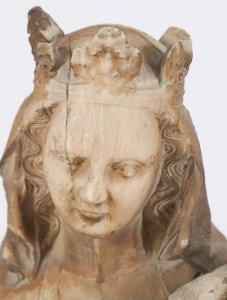 We also note that on the front side the hair, set under the overhanging crown, retains much more of the original definition in the carving than the surrounding areas. While examining the back and the front, we see a slightly reddish tinge of staining. The above wear, when considered together, indicates that the carving was outside. It was exposed to rain, ice, snow, avian droppings, as well as dust and atmospheric soot, possibly over centuries. The pink colored staining is likely from several sources: dust, soot, and/or metal. The rivulets to the front are signs of corrosive rainwater draining downwards, again over a long period of time. The lack of wear to the hair and the back, as well as the vertical striations, indicate these areas were protected, and that the front had the greatest exposure. We can deduce that the sculpture was displayed underneath a covered area, with only one side exposed. We also can infer that this space was possibly a domed or arched niche set into an exterior church wall, or more likely, a ruined early church where it had been venerated in a chapel. When looking at the loss of the head of the infant Christ, we notice immediately the difference in weathering to the surrounding area. This is the last condition we will explore. 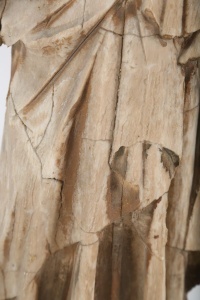 The break where the head was still has some coarseness, indicating later damage, but we cannot know exactly when the loss occurred. We can only speculate that after the head was broken and lost, the beautiful and mystical allure of the Madonna captured the imagination of a savior, who chose to treasure it and keep it away from further damage by the elements. There are always signs of wear to all works of art claiming to be of any age, however insignificant they may seem. These signs combine with one another to give us, the contemporary viewer, the confidence to confirm an object as authentic or condemn it as fraudulent.